Brett Kavanaugh will hear his first arguments as a Supreme Court justice Tuesday morning in Washington, his first day on the new job after a contentious confirmation process. Kavanaugh is expected to begin his tenure by hearing two cases dealing with matters of robbery and burglary. In the first case, Stokeling v. U.S., the court will weigh whether under the Armed Career Criminal Act, a state robbery offense should be considered a “violent” felony. In another case, U.S. v. Stitt, the court will mull the nuances of what under the Armed Career Criminal Act constitutes burglary. 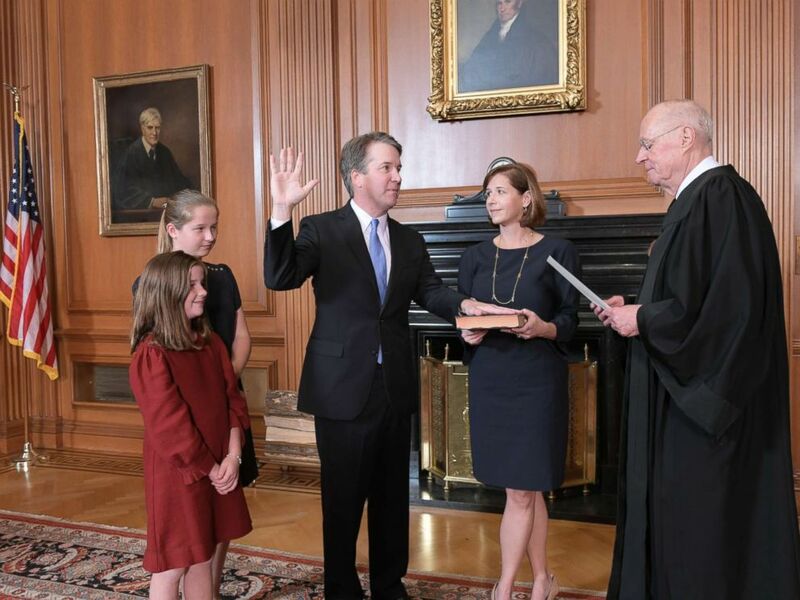 Retired Justice Anthony M. Kennedy, right, administers the Judicial Oath to Judge Brett Kavanaugh in the Justices' Conference Room of the Supreme Court Building, Oct. 6, 2018. Kavanaugh has denied the claim and others that later surfaced. An acrimonious and deeply partisan debate swiftly ensued as lawmakers argued about his fitness for the role and how the FBI investigation into his past was being handled. The controversy shone a spotlight on the complicated nature of politics and the #MeToo movement. On Monday, President Donald Trump called the protracted debate a "disgraceful situation, brought about by people that are evil," and at a ceremonial swearing in Monday night apologized "on behalf of the nation" and said Kavanaugh was "proven innocent." Sen. Mazie Hirono, D-Hawaii, told ABC’s Jon Karl on "This Week" Sunday that Kavanaugh will now take the bench with an asterisk next to his name.